Born in Philadelphia, Anderson earned fame in the black community as a church singer. 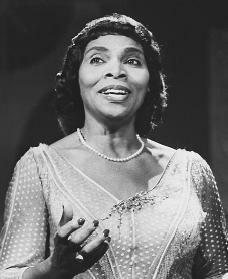 She went on to study classical voice, and performed in opera houses and concert halls throughout Europe, only to be turned down in 1939 by the Daughters of the American Revolution (DAR) when she sought to perform at Washington, D.C.’s DAR-owned Constitution Hall. Eleanor Roosevelt promptly resigned from the DAR, and persuaded Secretary of the Interior Harold Ickes to arrange a free outdoor concert at the Lincoln Memorial. Anderson performed on Easter Sunday to an audience of 75,000.